Mike Slubowski will be president and chief operating officer of Trinity Health effective May 15. For the past seven years, Slubowski has served as CEO of SCL Health in Broomfield, Colo.
Now, as the executive responsible for operations across the Catholic-sponsored system, Slubowski will report to Trinity Health CEO Dr. Richard J. Gilfillan. “Mike is an exemplary strategic leader who shares our mission and our vision for a people-centered healthcare system, and we are fortunate he is joining our team,” Gilfillan said in a statement. Slubowski is returning to the Trinity team. 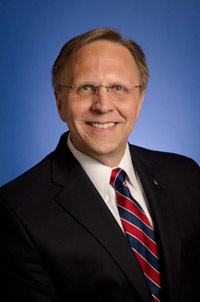 He previously worked as president of hospital and health networks for the Livonia, Mich.-based system. He is a 35-year veteran of the industry. Slubowski lead SCL Health through a merger with the Exempla Healthcare in 2014. Trinity, one of the nation's largest not-for-profit chains, just this week reported healthy growth, mostly as a result of cutting labor and supply costs and a boost from recently acquired hospitals. Trinity posted operating income before special items of $109.9 million in its 2017 fiscal first half that ended Dec. 31. That compared with operating income of $38.2 million in the same period a year earlier. Revenue in the first half jumped 10%, or $783.1 million, to $8.7 billion from $7.9 billion posted in the first half of fiscal 2016. In its financial disclosure this month, Trinity said the addition of three Connecticut hospitals included in the fiscal 2017 total contributed about half of its revenue gain. SCL Health is in Broomfield, Colo. An earlier version of this story listed incorrect headquarters.